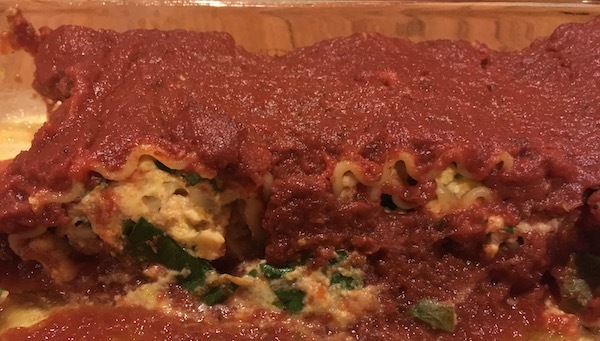 These dairy-free lasagna rolls made the Home Again Podcast short list of sanity-saving freezer meals. Anne created this recipe, and the non-dairy ricotta cheese substitute has the creamy texture that makes lasagna lasagna. If your family can eat dairy, just use ricotta in place of the almond/lemon juice/salt substitute. The ricotta freezes well, so no worries about making a double batch so one can go in the deep freeze. Soak almonds overnight and slip them all out of their skins. Puree with just enough water to keep your blender blending. (A Vitamix blender works best.) Once nuts are pureed to a smooth consistency, add lemon juice and salt until it tastes like ricotta cheese. Set aside. Preheat oven to 350°. Cut squash in half the long way and scoop out seeds. Place squash halves, skins sides down on large cookie sheets. Bake in the oven until soft. Scoop out flesh, mash well, and combine with cheese substitute. Add the spinach, garlic, and eggs to the cheese substitute/squash mix. Add salt to taste. Set out 3 9 x 13 (or smaller) casserole dishes. Spread cheese mix on cooked lasagna noodles and roll them up. Put 8 or 9 lasagna rolls in each casserole dish. Spread a can of marinara sauce over each pan of lasagna rolls. Bake 1 pan at 375° for about 30 minutes. Cover the other pans with foil after labeling the foil with a Sharpie marker. These rolls are very filling. One pan feeds a family of five with no left overs. Add a green salad, and you have a complete meal!